Come away from it all....catch your breath. The Bold Colorful Life estate consists of four New England-style buildings: the main Farmhouse and historic, 200 year-old Homer Jones barn; a centrally-located garden shed, surrounded by gardens; a charming, renovated 1800s Cape and the Gallery Barn. The Antique Cape combines new convenience with its historical heritage, with an exterior wrap-around porch and dormers, and a private back deck with great views of the shady woodland, home of the reclusive Lady Slipper, the apple orchard and the Gallery Barn. Inside, the first floor holds a comfortable, fully-equipped kitchen, dining room and living Room, all set off with the original pumpkin pine flooring, and furnished with antiques. There is also a first floor bedroom, the Garnet which has a Full-sized bed, and private bath. The Garnet and living rooms face the courtyard, the Farmhouse and the river. A cozy computer nook at the top of the stairs also faces the courtyard and is one of the best spots to pick up the WiFli. On the second floor are four additional bedrooms with three private baths. The Ruby Peridot suite, a Queen bed in the Ruby room, with a privacy-shaded French door leading into the Peridot, twin room, share the Ruby Peridot bath. The Turquoise, with a Full oak sleigh-bed, facing across the Back River Road to nine acres of woodlands, also with private bath. And the third, the Butterscotch Amber bedroom, with two twin beds, its own sitting room and with the unique bath with both clawfoot tub and shower. Wake to birdsong in the apple trees and early morning fog on the Back River....then make yourself delicious coffee and a hearty, healthy breakfast in the fully-equipped kitchen in the recently renovated 1800s Cape. Refreshed, venture out into the Boothbay region to join a tour boat to see whales or puffins, or to go lobstering, shop, view our many art galleries, try some local restaurants and generally have a memorable visit. The Coastal Maine Botanical Garden is only 4 miles away! So is the world-class Boothbay Harbor Country Club golf course! Or try hiking at any of the 13 preserves within 10 miles of this home. At the end of the day, imagine coming ‘home’ to a snack and drink on the wrap-around porch....a good book in the hammock.....a sunset through the windows....and a long, delicious sleep in one of your five lovely bedrooms with four private baths, colorful bedding, paddle fans, cable TV, WiFli. Or come home to a peaceful evening in one of your five elegant bedrooms with five private baths, colorful bedding, paddle fans, cable TV, WiFli....in the Farmhouse across the courtyard. Renewed again, live your bold and colorful life! 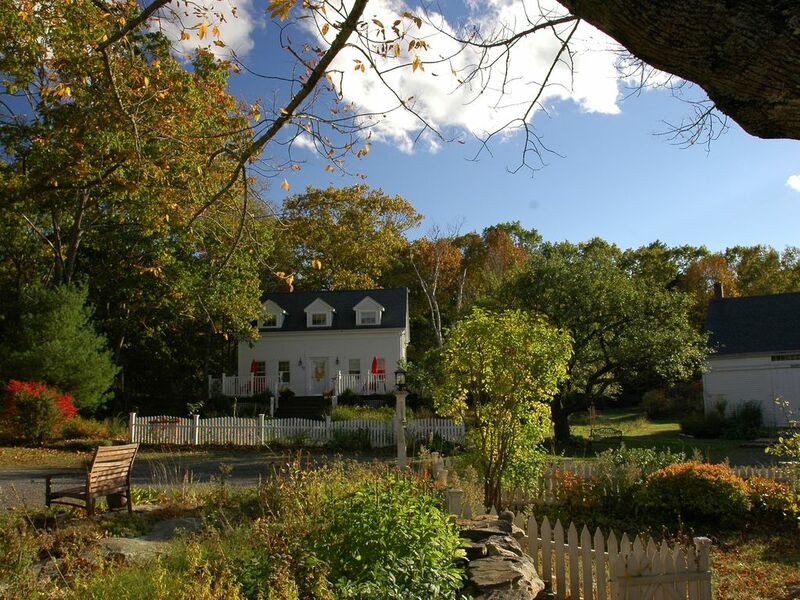 Both buildings (the charming historic Cape and the elegant Farmhouse) are available year-round. It's the perfect destination for a personal retreat, family or school reunion, wedding or other gathering event. See more by googling Bold Colorful Life Estate and Retreat Center. I’ve been saving for my ‘dream house’ for 40 years....and I fell in love with kayaking about 8 years ago. After a five year search through waterfront properties in CT, the Adirondacks, MA, NH and finally ME, this was the property that offered the combination of things I'd been seeking. And it was perfect for building vacation rentals so that the awesome environment could be shared. The setting is idyllic...with fields, woods, many perennial gardens, apple trees, lilac trees and old stone walls wandering down to the Back River. There are 15 acres of land, facing west for sunsets, on the protected waterfront of Maine and with a big freshwater pond and woodlands. The whole estate sits atop Maine ledge, which is sculpted to fall gently towards the water. It's in an area where I am able, in the 'off-season', to offer weekend and week-long retreats that combine personal growth, spirituality and 'back to nature' events, including hiking, paddling and exploring the nearby Botanical Gardens. And I want to share this beauty with as many people who love Nature and the wild, wonderful aspects of Maine as possible...so vacation rentals are the perfect answer. Mother Nature has shaped this property to be both elegant and beautiful...the buildings are on the plateau at the top of the estate and the lawns and gardens, stone walls and woodlands slope gently down and down to the Back River. A great Blue Heron often visits the freshwater pond; then flies off towards the river. Our local pair of bald eagles are seen wheeling overhead regularly as the tides change. A huge porcupine was seen at the south end of the property recently and we have visits from foxes and deer, ospreys and hawks. The property has a healing energy which most people feel the moment they step onto it. A visit here fills the vision with color, the spirits with hope and the body with calm and peace. The Boothbay peninsula offers the perfect getaway. The area is naturally breath-taking, with forests and fields, farms and gardens, brash rocky coastline and gentle coves and lakes. Boothbay Harbor is a charming town with lots of engaging activities and it’s just six miles down the road. This is the area to go shopping, visit galleries and craft fairs, sample local fare at great restaurants, enjoy deep water activities like whale watching and lobster-boating. And there are natural bonuses: 13 nature preserves for hiking within 10 miles---5 within 5 miles---one within 1/2 mile; a world-class Botanical Garden within 4 miles; kayaking possibilities in rivers and lakes and the Atlantic. We also have a world-class golf course 4 miles away. The Rockland/Camden area and Freeport shopping are within an hour's drive in either direction; and my favorite Maine park, Acadia National Park is just under three hours away. Nova Scotia and Prince Edward island, both favorite parts of Canada, are nearby too… The Bold Colorful Life Estate is also a Retreat Center, so plan to join us for a Retreat for personal growth, renewal and spiritual centering...The Bold Colorful Life Gallery offers colorful elegant jewelry, stunning natural photographs, and dramatic works of art in oil and pastel to our rental guests...when it's open. The Ruby Peridot bathroom has an over-sized diamond-shaped shower and is decorated in the pink and green of the two rooms in the Suite. The private Turquoise bathroom has a shower, as has the Garnet bathroom on the first floor. The Butterscotch Amber bathroom has both a claw-foot tub and a shower. The tub looks out over the apple trees to the Gallery barn. All baths have barnboard and shiny pumpkin pine floors. These bathrooms provide a private sanctuary. Six miles from this property, the tidal Back River empties into the Atlantic Ocean. On the way, you'll pass the amazingly beautiful Coastal Maine Botanical Gardens...located right on the Back River! At low tide, you will often see dozens of birds on the uncovered islands & day or night hear the haunting call of the loons. There are half a dozen seals who like to play in our cove. The estate has 300 ft of water frontage on the river, which empties & refills every six hours & wildlife is profuse. At half & high tide, you can swim, paddle, canoe, fish or just sit & admire views. The Cape has a new heat pump, which heats in the winter and cools in the summer. Additional air Conditioners are available for rent...for $50 per week or per visit. Linens are provided and beds are already made when you arrive. Please leave linens washed and folded when you leave. We'll make up the beds for the next guests. Thanks! Front loading electric washing machine in the basement. Two front loading electric clothes dryers in the basement. Towels are provided, but please do bring your own beach towels. Work out at the local YMCA, 5 miles from here. The Cape living room is equipped with cable TV, VCR and DVD players, boom box, books, DVDs, etc for your entertainment. In pantry, with toaster oven and a myriad of other equipment. The pantry and cupboards are stocked with staples. Our policy is feel free to use a little. If you use a lot, please replace the item for the next rental guests. The Cape has a full private kitchen with refrigerator, electric stove & oven, sink & kitchen island. Pantry includes:microwave, toaster/toaster oven, waffle iron,dishwasher& additional equipment. All rooms have cable access. The Cape has three televisions. Boom box equipment on the bookcase shelves in the living room. In the bookcase in the living room. Puzzles and art equipment on the shelves of the bookcase between the kitchen and dining rooms. On the bookcase shelves in the living room. See all the lovely lawns on our website...boldcolorlife.com. Six kayaks plus life jackets are available to our guests, complimentary. There are also local rental places for sea kayaks. Rent bicycles in downtown Boothbay Harbor. The Cape has a wraparound deck and two seating areas. The large table with chairs is on the back deck; two small 'flirty' tables with chairs are on the front deck. Play tennis at the local YMCA. Golf at the nearby world-class Boothbay Country Club. The Cape wrap around deck is accessible with a ramp, but does not have the interior space for wheelchair accessibility. The pond is full of tadpoles in the spring and frogs in the summer, with Maine painted turtles and wildflowers. The Back River is a wonderful place to splash, swim or paddle a kayak. On site and nearby are great places to walk and hike--hiking poles are loaned to guests. We have rainy-day puzzles, artist kits, books and movies. Catering is available from local providers. Refreshed, visit the whole Boothbay region. The Coastal Maine Botanical Garden is only 4 miles away! Try hiking at any of the 13 preserves within 10 miles of this home. At the end of the day, imagine coming ‘home’ to a snack and drink on the wrap-around porch of your antique Cape...a good book by the fire...a sunset through the windows...and a long, delicious sleep in one of your five lovely bedrooms with private bath, colorful bedding, paddle fans, cable TV, WiFli. Air conditioners are available for ‘rent’. Since they are not ‘green’, there is a $50.00 fee for the week or the visit. This is a beautiful waterfront property set on acreage just outside of Boothbay Maine, a charming coastal town in middle Maine. The property has adorable details and the owner is generous with her time and talent and such a gracious host. There wasn't a thing we wished for the entire trip. The home is built well and coming from Atlanta we were a little concerned for a lack of central air conditioning, but it was all for nothing. The mid-summer nights were cool and refreshing and we enjoyed the open windows and sweet breezes (the owner does have air conditioning available, by the way). There was another family staying nearby but we really didn't see or hear them the whole time. We had a relaxing time in the hammocks, watching the wildlife (we did kayak with seals in the bay!) and visiting the local sights, and the evenings were cool enough for bonfires and smores. Despite the country feel to the location, we were less than 15 min from good groceries and attractions. There isn't anything better than fresh-caught Maine lobster. The wifi was consistent and strong and we were able to stay connected and work while visiting because while you want to "get away" complete disconnect is pretty unrealistic. We are thankful for the place Melissa, the owner, provided, with gracious amenities and hospitality and wouldn't hesitate to recommend it to anyone else. Sometimes when places are historic, they feel dirty but that was NOT the case here. A fresh coat of paint and attention to cleaning details left us comfortable. One thing to note is the checkout policy where you must wash and dry all linens prior to departure, planning for this policy in your travel plans. This is a unique policy to any other place we stayed. What a fabulous time our group of 6 had at this property! Our lodgings in the beautiful farmhouse were extraordinary with such grand spaciousness. Wow, what a kitchen that we used constantly and the library room was so cozy too. All was perfect, and the setting was so peaceful. We loved walking the woodsy road and trails and simply gazing at our surroundings. It all rally fed our souls, and we all hope to return again in the future. The surrounding towns were such fun to visit and the fresh lobster and oysters were unbelievable. Book it - you will be so happy that you did! To Melissa: Thank you so much for all your kind words and for your thoughtfulness while we were in Maine. My mother passed away last June, When we were kids, we had a cottage in Damariscotta and spent much of our summers there. Picnics at Pemaquid Point were among Mom’s favorite times. To commemorate her life, we decided to have a whole family reunion a year after her passing. We rented both the Farmhouse and the Cape to accommodate the large group. The week turned out even better than I had hoped… in no small part because of the wonderful and comfortable accommodations provided. The place is lovely. It’s clearly something that you should be very proud of: fully equipped, completely stocked, well maintained, clean and spacious. And the attention to detail is amazing. It was a joy and a surprise that even after 7 days, we’d walk into a room and see some other interesting/lovely/curious (and of course, color coordinated) item that we hadn’t noticed before! I am glad to know that my rather large crew was not an imposition or disruptive. The children are generally well behaved but with that many kids and that young, you never know!!! Their good behavior was a result of how happy they were. The spacious lawn with a range of paths weaving through the tall grass kept them running around for hours. The prospect of making ice cream one night and having s’mores at the fire pit another night also may have encouraged good behavior. I am ever so thankful to have found such a lovely and comfy place for my family to be together and to build more happy memories as we celebrated my mom’s life. I probably can't find adequate words to tell you how honored I am that you chose this property for your family reunion and tribute to your dear Mother. Each time we were in contact as you planned the visit, you were a delight...and when you arrived, every family member was friendly, fun and positive. It is an awesome family group...I'm sure your Mother was superbly proud of you all. And the children exploring the property were a great addition...such wonder...such camaraderie...such energy...such life force. It was a joy to observe them whenever we were here at the same time. Also, I thank you for taking such good care of the house...as though it were your own. It would be a pure delight to have you return for another gathering some time soon. My extended family stayed here for a week in July. Everyone loved the home, the area, and Melissa. The house has all of the needed amenities, plus oodles of charm. Melissa is gracious and very responsive to any needs or requests. She is there when you need her and appropriately out-of-sight otherwise, kind of like a fairy godmother! If you want a relaxed but interesting place to visit, this is definitely it. Wonderful off the beaten path retreat. There isn't much to say other than it was just a wonderful getaway. Melissa was an informative and gracious host. The grounds are gorgeous. The cape house is quaint with old house charm. If you like old houses in the woods with water access, this house is for you. Would totally return for another trip. Will and his group were a complete delight...every interaction was friendly and warm. Communication all along the way was terrific, and it was fun to hear about the various outings the group was enjoying. I look forward to having a return visit! This cape was rented along with the Farmhouse and was a welcomed addition to the space we needed. Both houses are well maintained and clean. It has a lot of character to go along with it's Maine charm. I'm so glad that you had plenty of room to spread out...with private space for each member of your group...and that you enjoyed the kitchen, deck and that big barn table!! And I love the idea that you all have been meeting for a getaway weekend..to golf and fish...for decades...good for you guys! It truly was a delight to have you all here...and I'd be tickled to have you return...as a group and/or with family members. You added such excellent energy to the place!! Come away from it all....catch your breath. Wander 15 acres of estate gardens and woodland trails....borrow a sit-on-top kayak or an inflatable boat to paddle with local seals....meet our friendly bald eagles and other critters....listen to the loons on a River View bench...play croquet or badminton on the many lawns....watch the Maine painted turtles or listen to frogs on the freshwater pond....wander the park-like grounds....take a cool dip or sail on the river...enjoy a book in a hammock. Refreshed, venture out into the Boothbay region. Close proximity to ocean, restaurants, mini-golf, boating, world-class golfing, the Coastal Maine Botanical Gardens and every kind of shopping and gallery. There are 13 hiking preserves within 10 miles, freshwater swimming and ice fishing at Knickerbocker Lake, 3 miles down the road. There are small Maine beaches within 10 miles and large ones within an hour's scenic drive. Other Activities: Shopping, Kayaking, Boating, Wildlife Viewing, Hiking, Health/Beauty Spa, Horseshoes, Mini Golf, Antique museum and Railway Village, State Aquarium, tours to see islands, puffins, whales and lobster boats. There's a year-round Opera house, movie theatre and Historical Society. And did we mention the local restaurants and shops??? The Bold Colorful Life Gallery offers colorful elegant jewelry, stunning natural photographs, and dramatic works of art in oil and pastel to our rental guests....when it is open. All guests are required to fill out, sign and send a contract for the rental terms. The address is 802 Back River Rd., Boothbay, ME 04537 Rates are subject to change until reservation is confirmed.